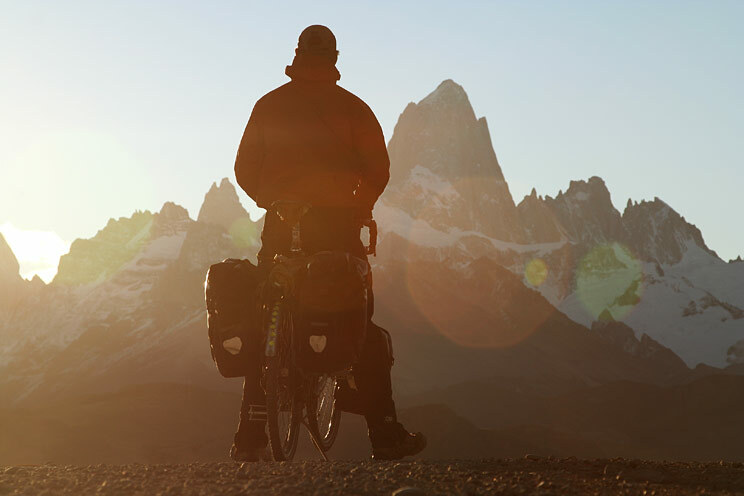 The Final Chapter covers the last stage of my travels through the bottom tip of South America, from El Chalten to Ushuaia, Argentina. Starting in El Chalten, my route snaked its way back and forth across the border of Chile and Argentina, through the vast Patagonian steppe and a series of stunning national parks to the port town of Punta Arenas, Chile. 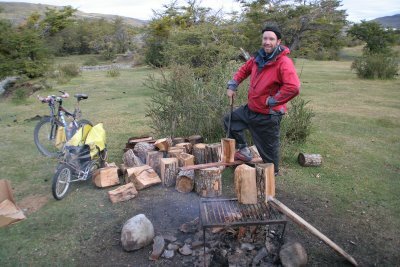 After reaching the bottom of continental South America at Punta Arenas, I crossed by boat to the Fire Island, Tierra del Fuego and continued pedaling for 6 days to the end of the road, in Ushuaia, Argentina, the southernmost city in the world. Los Glaciares National Park, which borders the village of El Chalten, was a magical place for me. 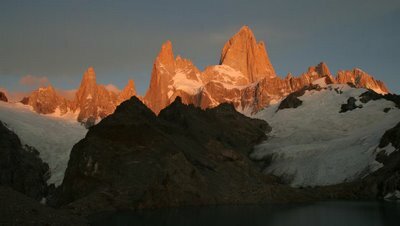 It’s signature backdrop mountain range, the Fitzroy Massif, (which provided the inspiration for the Patagonia Clothing Company logo) held my attention for nearly a week. During the peak of the full moon cycle, I hiked and camped my way through the Park’s lakes, ridges and valleys flanked by a deciduous forest in fall bloom. 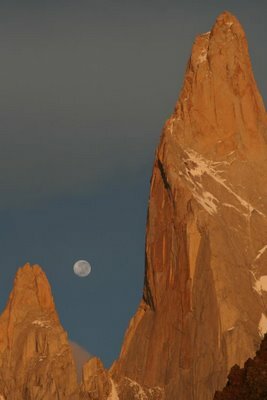 I took hundreds of photos of Fitz Roy--mid-day silhouettes with lens shaped lenticularis cloud formations overhead, backlit sunsets, and eerie full moon night-scapes. I also had the privilege of witnessing the “Sunrise of Fire” on three different occasions, where, for a brief moment in the early AM daybreak, the clouds rose just high enough to direct the sun’s rays at a near perpendicular angle against the granite peaks causing the entire range to glow fiery red. My colorblind eyes have never witnessed such a spectacular contrast between land and sky. I pedaled out of El Chalten alone on a dead straight gravel road that will likely be paved by the year’s end. Fitz Roy had been taunting me in my rearview mirror. Fifteen miles out of town I set the Geoduck aside and hunkered down on a patch of sharp grass along the side of the road for one last gander. The sky exploded over the peaks at sunset. Flashes popped from behind the windows of an occasional shuttle bus rushing its clients to fancy resort hotels. I pedaled 18,000 miles to reach this viewpoint and wanted to enjoy every last drop of it. I decided to roll out my sleeping bag and bundled up to watch the clouds, lit by the moon, speed over the peaks throughout the chilly night. At 6 AM, I awoke to find a herd of guanaco grazing fifty meters away and two Canadian photographers quietly staking their claim to shoot the morning sunrise just feet away from my sleeping bag. 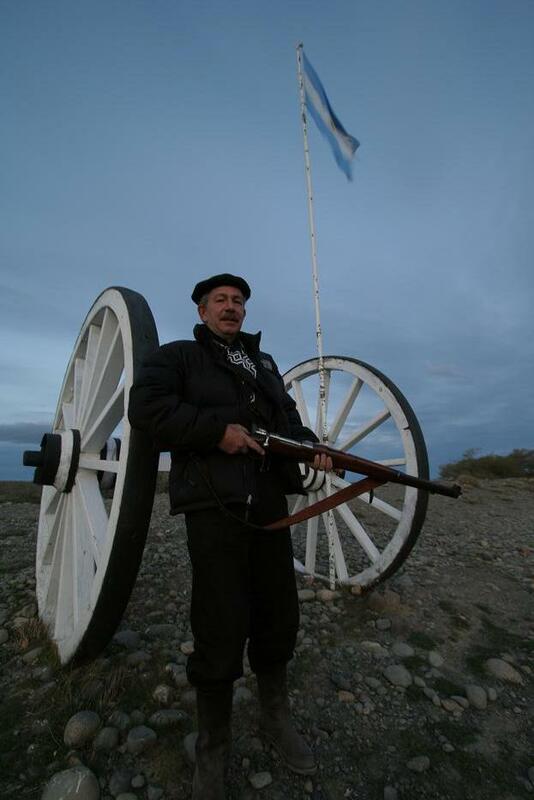 Don Thomas and I rejoined forces and eased our way past hundreds of miles of barren Patagonian grasslands. Under the watchful eye of a Burrowing Owl, we made camp in the site of Butch Cassidy and the Sundance Kid’s last hideout before fleeing to Chile. Giant birds of prey lined old wooden fences bordering Estancia farms along the road. Flightless ostrich cousins called Nandús sprinted beside us along some of the more remote gravel sections and foxes crawled under my tent vestibule at night. A wealthy media mogel from Buenos Aires allowed us to camp on his land and even changed out one of Don Thomas’ crusty 100 dollar travelers checks. In a classic display of bravado, he took Don out back and gave him a thorough demonstration of his new, sawed off, 12-guage shotgun after he caught him checking out his daughter. National Geographic magazine calls Patagonia the windiest place on the planet. I wouldn’t disagree. A local ranch hand told me that two years ago an Italian climber’s body was found 5 kilometers away from the Cerro Torre, a massive spire in Los Glaciares National Park, after the wind snapped his ropes and blew him off the face. Full sized tour buses are frequently lifted off the ground and flipped upside down while parked. The howl of the Patagonia wind was a constant companion for the last month of the trip and I could feel the land being pinched together as I approached the world’s end. This “pinching” allows the wind to forcefully punch its way through the Southern Andes from the Pacific Ocean to the Atlantic. Cycling east, it was a free ride. I could literally kick my feet up, West Coast Chopper style, on my front panniers and make speeds of 25+ MPH without pedaling. Going west it was another story and a 3.5 MPH average was pretty good duty. I often went mad in these sections, tossing my bike in a ditch or under a bridge for 30 minutes while cursing my brains out in bad Mexican taco stand street Spanglish. Eventually, my cursing turned to laughter and I summoned the energy to continue on. As contrary as it may sound, I loved every minute of it. After checking out the massive glacier formations in the Southern Patagonia Ice Field near El Calafate, Argentina, we crossed back over to Chile and into Torres del Paine National Park. The park has a reputation for fowl weather. Nighttime snowfall and below freezing temperatures were common and I had an urge to speed through this section before the full brunt of winter arrived. Don Thomas reminded me of a promise I made to myself after reading a magazine article several months before—I was not going to leave the this Park until a clear day arrived and I could properly take pictures of the Paine massif, a needle shaped spur of the Andes (Torres) from which the Park gets its name. We kept each other amused over cheap wine and colossal campfires at a nearly empty park campsite while waiting for the weather to improve. After two windy, rainy days and nights in our tents we were completely stir crazy. I concocted a plan to stretch our legs and clear our heads via a hike to nearby 5 star adventure lodge that purportedly had a nice exhibit on the park’s wildlife, including its surging Cougar population. This kicked off the single most expensive day in the history of the trip. The wildlife exhibit held our attention for five minutes and we huddled around a wood burning stove in the lobby and talked about what to do next. It was pouring rain outside. Something smelled like my break pads while burning down the 16,000 foot hairpin passes in Peru. I delighted myself in laughter as, in the coldest, wettest, windiest section of the trip, I noticed that the front thigh sections of Don’s Gortex rain pants had completely melted away from the heat of the stove. He didn’t think this was as funny as I did and we split up to explore the rest of the compound individually. I found the bar first, bellied up, and ordered a round for both of us figuring my travel-mate would show up by the time the second brew was topped off. He arrived right on schedule, took a seat and pointed down to thigh section of my Gortex rain pants. “Hey genius, you feeling a bit drafty down there?”. I looked down and noticed for the first time that that damned wood burning stove burnt a gaping gash through the front of my rain pants as well. Current daily tab “$400 in Gortex”. A few high-end backpackers showed up in the bar. We were feeling generous and bought them a round, then another round for us, and then another as the rain wouldn’t stop for long enough to consider a dash back to our campsite with our newly ventilated rain gear. Eventually the deluge slowed to a trickle and Don offered to pick up the tab on his card. We never bothered to check the price of beer in the eco-adventure lodge. “Add $115 to the daily tab”. This might not seem like such a huge cost for a night out in Paris paid in Euros, but consider that an average beer in a city in Chile/Argentina costs MAYBE $1.00. 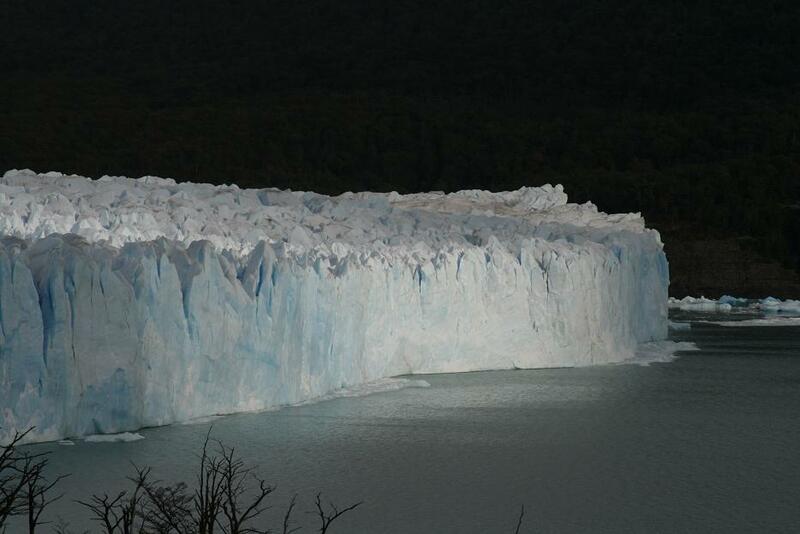 Oddly, Don Thomas decided to buy a camera 10 months into his 1-year trip, in Bariloche, Argentina. That was the last time he used his credit card. The purchase tripped the code-red o’ meter and his credit card was deactivated and thus rejected by the adventure lodge who promptly handed him a phone to dial the 1-800 number to sort it out. Forty minutes later, he hadn’t sorted it out and I hiked back to camp in the dark to get my card. When I returned, he was still on the phone. My card passed the test and we decided to beat it on out of that place before more damage ensued. On the way out of the lobby, the front desk manager ran us down. “Excuse me Mr. Don Thomas, we need to talk about your phone call”. “Yes, you see, even though you dialed a 1-800 number…that was a satellite phone you called from”. “Add $195 to the daily tab”. One week later, at an internet café in Puerto Natales, we figure out that the hotel doubled charged us on both cards and that Don’s card was working after all. “Grand daily total to chugga’ few beersks and stretch the dogs at the Eco-Adventure Lodge, “$725”. Don, who put himself through college selling books door to door, called the lodge immediately after our discovery in the Internet café. 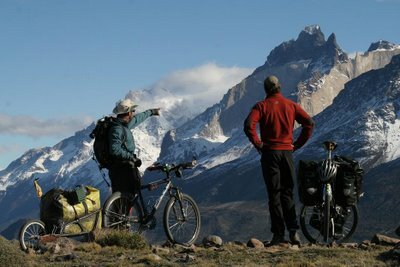 “The last thing you do, is get me pissed off and on the phone with a softy Chilean adventure lodge manager” he exclaimed. The charges disappeared from our credit card bills almost as quickly as they were racked up. Eventually, our calculated luck paid off, the sky opened up and we were treated to perfect vistas, sunsets, and sunrises in Torres del Paine, one of the world’s great national parks. The next few weeks we continued south across grassy pampas and sprawling Estancia farms dotted with twisted Southern Beech trees, bent permanently to the east from a lifetime of pummeling by the wind. We reached Punta Arenas, the Southern-most port city in the Americas and enjoyed several days of rest, discoteca dancing, and general mis-adventuring amongst our peers. We took the ferry to Tierra del Fuego (The Fire Land), an island a the tip end of South America that gets its name from the Yamana Indians who often burnt huge fires to stay warm as they wore little or no clothing. On the island we were treated to Patagonian lamb and seaweed soup, homemade bred, and shelter provided by the local Estancia owners after we were assaulted by a howling snowstorm. From here on out, we mostly cycled or pushed our bikes through the snow. On our last night on the road, we were offered accommodation by Emilio, the owner of Panaderia la Union, the dopest bakery on the planet, open 365 days a year, 24 hours a day in the micro-village of Tolhuin. Emilo’s bakery comes equipped with an array of scantily clad celeb-photos, internet, mouth watering baked goods, chocolate sweets, coffee bar, massage center, and a complete indoor zoo with Tucans and beavers. He let us sleep on massage tables in the third floor observation platform and told his employees that we had an unlimited use, all you can eat, free punch card with no questions asked. I pinched myself to make sure that I didn’t get run over by a chicken truck and sent to heaven earlier in the day. I woke up at 2AM to raid the pastry counter downstairs for the umpteenth time and found a gaggle of South American supermodels in designer pajamas, huddled around the chocolate selection. In a flash they were back on their plush tour bus before I could figure out if I was still dreaming or not. The next morning, we awoke to the sweet goodness of smells from the bakery below wafting up to our sleeping platform. Don Thomas, who was up before me for the second time in our 10 months of traveling together, exclaimed “Gregorio, this is the only occasion in my entire trip that I have woke up in the general vicinity of YOU when the room, tent, ditch, cave, or whatever actually smelled good”. With that said and a few more brotherly insults exchanged, we gorged ourselves on Emilio’s gracious, sugary sanctuary meal ticket before climbing on our bikes for the last day of the journey. The last day of my trip was not surreal nor did it include any sort of life epiphany but was rather an incredibly difficult and treacherous finale. We climbed the final high pass before Ushuaia in the morning sun, crested its summit, and descended in a snow flurry. As we lost elevation, the snow covering the road grew to over one foot deep and it was necessary to push the bikes over its surface. We were just a stones throw away from Antarctica, in late fall and it was freezing cold. I had to make regular pit stops to rotate my arms softball pitch style for several minutes until enough blood flowed to my hands to ease their numbness and allow me to continue on the bike. The drops of fluid from my runny nose were freezing into my facial hair. Just a few miles outside of Ushuaia the road cleared of snow and we cruised the final downhill with dreams of a grand celebratory beersks drinking session hot on our minds. With less than 4 miles to go, Don Thomas looked over at me in the pitch black darkness and said “well buddy, I think we’ve done it, we’re really going to make it to Ushuaia”. I agreed and we hooted and hollered at the top of our lungs. Next, the Geoduck hit a patch of black ice and I went down hard, slamming my right hip and head on the tarmac at full canter downhill speed. 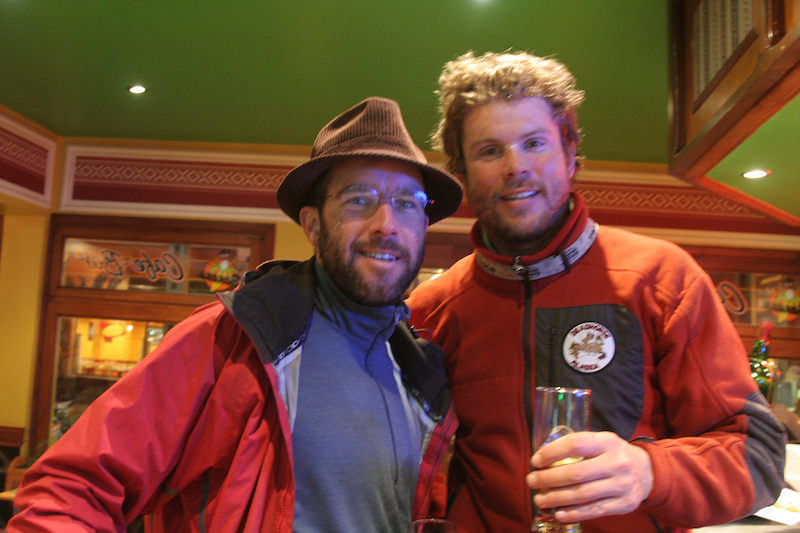 Fortunately, I was so cold that I couldn’t feel anything and we pedaled proudly to the first decent looking drinking establishment that we could find in Ushuaia. After inhaling a plate of spaghetti and two beers the room started to waver back and forth. “Don”, I exclaimed, “I think that this whole experience has finally just hit me”, “the room is spinning and I can barely keep my thoughts in line!”. “Dude, maybe it’s because you just slammed your head on that cement road at 20 MPH--you probably have a concussion!”. El Don was right, I ended my party prematurely and wandered back to my hotel room alone where I celebrated the conclusion of the completion of a life’s dream by sleeping non-stop for 2 days. I rested and wondered around Ushuaia for nearly 1 week before organizing my return to Seattle, WA. The last and most important thing on my to do list before hopping a flight back home was to pick out some postcards from Ushuaia. So many people had assisted me along this journey--thanking them with a hand-written note was my way of distributing gratefulness and creating the final closure for the journey. My list of addresses included zip codes from over 15 different countries directed to multi-million dollar estates, dilapidated wooden shacks, and slingers of the finest beer, coffee and sweets along the Pan American Highway. I was the last passenger to cross the frozen tarmac between the terminal and my Boeing 737 heading north to Buenos Aires. A few steps before reaching the boarding ramp an awkward chill tingled its way up my spine. With the exception of my bridge between Central and South America, this would be the first time in my 18,500-mile route that I would travel over the earth’s surface without smelling its season, squinting at its horizon, or feeling the burn of its hard landscapes in my hamstrings. How could I have forgot the most important thank you of my entire journey? I turned to face the new quarter moon that illuminated the pampas along the airport runway, tipped off my Chilean gaucho hat, and bowed deeply to our planet. I thanked it for demonstrating its magic time and time again, for granting me and Geoduck safe passage across its latitudes, and for teaching me that, when you truly surrender yourself to your dreams, nothing is impossible. What an amazing world we live in, I wish it could stay this way forever. This has truly been a surreal journey, thank you for sharing it with me!